This is the premier collection of dialogues, talks, and writings by Philip Guston (1913–1980), one of the most intellectually adventurous and poetically gifted of modern painters. Over the course of his life, Guston’s wide reading in literature and philosophy deepened his commitment to his art—from his early Abstract Expressionist paintings to his later gritty, intense figurative works. 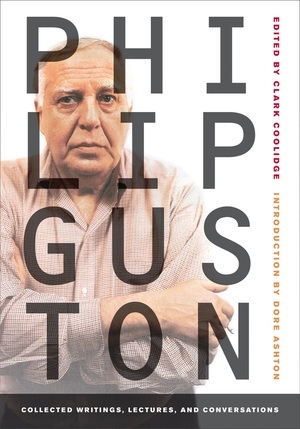 This collection, with many pieces appearing in print for the first time, lets us hear Guston’s voice—as the artist delivers a lecture on Renaissance painting, instructs students in a classroom setting, and discusses such artists and writers as Piero della Francesca, de Chirico, Picasso, Kafka, Beckett, and Gogol. Clark Coolidge has published many volumes of poetry and a collaboration with Philip Guston, Baffling Means: Writings/Drawings. Dore Ashton is Professor of Art History at the Cooper Union. Her many books include A Critical Study of Philip Guston, available from UC Press.